The Raoul Wallenberg Foundation claims for the closing of one of the most controversial and lasting human right s cases since the end of World War II. Next 17 January is the 71st anniversary of the disappearance of the man who helped save the lives of thousands of persecuted people during the Holocaust. To remember Raoul in a new anniversary of his disappearance, the Raoul Wallenberg Foundation is pleased to announce that the documentary film about the life and fate of Raoul Wallenberg being produced under the fiscal sponsorship of the Foundation is now entering post production. The filmmakers, which include award winning director Brad Rothschild, Emmy Award-winning producer Brian Mait, New York Times bestselling author John U. Bacon and Executive Producer Alex Ruthizer, have shot over 80 hours of interviews with Wallenberg’s family, Holocaust survivors saved by Wallenberg, world leaders, diplomats, researchers, biographers and Russian officials on location in Sweden, Russia, Hungary, Israel, Switzerland and the U.S. The film is scheduled for completion in late 2016. This film will revive and preserve the larger than life story of Raoul Wallenberg, the young heroic Swedish, who in 1944 left his life of luxury to volunteer for a dangerous mission to save 100,000 Hungarian Jews from certain death. The film will focus on his short life, time in America at the University of Michigan, his heroic and selfless action and his tragic disappearance into the Soviet gulag. 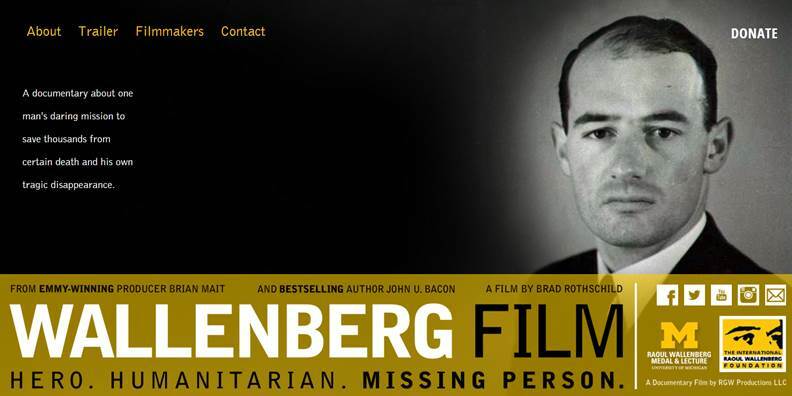 Donations: Donors wishing to preserve Wallenberg’s legacy through this film are asked to make a 100% tax-deductible charitable donation to The International Raoul Wallenberg Foundation, the film’s fundraising partner and a New York-based 501c (3).